Have the Wings finally been brought to their knees? These are the days of the Detroit Frayed Wings. Sad to say, but the bumpy ride that has been this Red Wings season is a precursor of things to come, I’m afraid. This is a franchise on the decline, in need of rebuilding, living on the last fumes of a decade-plus of excellence. It hurts to write it, believe me. Calling Dr. Holland? What follows is my assessment of the state of the team as the Wings prepare to play the Kings on Saturday, a team on an 8-game winning streak and 9 points ahead of Detroit in 4th place in the Western Conference with 25 games (50 points to play). In other words, the math for 4th place is not good for the tied-for-8th Wings and makes this game a MUST MUST one instead of just the usual MUST. GREY WINGS: Start with the No. 1 D-pair, Nick Lidstrom and Brian Rafalski. Still better than most, but certainly not as sharp as they used to be. Big slip from two years ago. And there’s chatter that Lidstrom will not return and go home to Sweden if Ken Holland blows up the team. Kris Draper is 38, Kirk Matlby 37. Thanks for your service, guys. But sadly, it’s time to say goodbye. You are salary cap impediments now. INJURY PRONE: You certainly have to start with Andreas Lilja, who at his best is a 5-6 D-man. Add to that Niklas Kronwall , Johan Franzen and the honorably fraying Tomas Holmstrom, whose cap hit, despite his on-ice value and courage, has to be tempting to Holland. When the Wings let Raflaski, Holmstrom, Draper and Maltby go, consider this team in full dynamite (as opposed to DY-NO-MITE!!!) stage. NOT AS GOOD AS ADVERTISED: Start with Ville Leino. You can add Jonathan Ericsson, who has taken a Dion Phaneuf-sized leap backwards this season, and Brett Ledba, who hasn’t been the same since Chris Chelios left the team. And I’m tempted on given nights to add Brad Stuart (that pretty much covers the rest of the defense without a lot of up side, doesn’t it?). UNDERACHIEVERS: We’ve learned this year that Henrik Zetterberg and Pavel Datsyuk are second-tier superstars with first-tier pricetags. I guess you’d consider that a backhanded compliment. They are great players. But neither are Crosby and certainly not Ovechkin (who may be one of the greats of all time). They can’t carry the Wings by themselves. THEY ARE WHAT THEY ARE: Danny Cleary, at 31, is in his prime. What you see is what you get: Role players. Also, Patrick Eaves (a Cleary wannabe); Derek Meech, Drew Miller, Jason Williams. They are six of one and half a dozen of the other-type players. Every team has players like them. You need them. But with the possible exception of Cleary, the Wings could replace them with other decent spare parts. THE FUTURE: Doesn’t leave a lot left, does it? Three players stand out for not making any lists so far: Valteri Filppula, Darren Helm and Jimmy Howard. So here’s my question: Would you want to build your future around those three players? Do teams like the Kings, Coyotes, Capitals and Avs easily exceed those three in future upside, just to mention a few? Do you see that much talent in the Wings’ farm system? TOP-SIX FORWARDS: The Brian Burke model says you have a top-six and a bunch of role-playing forwards. The Wings’ top six would be: Datsyuk, Zetterberg, Franzen (that’s about one-third of the Wings’ salary cap), Filppula, Holmstrom and Betuzzi. Consider injuries and age, who really is an easy-to-pick 7th? OK, Cleary (who I should have included on the injury-prone list). 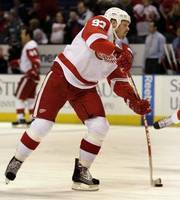 TOP-FOUR D: Lidstrom, Rafalski, Kronwall and Stuart, already discussed. How much gas is left in this tank? 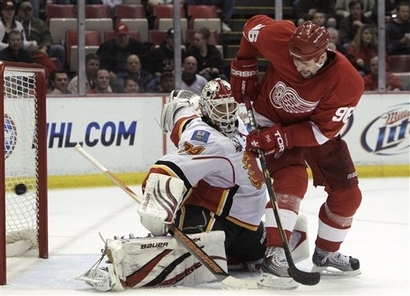 LAST LINE OF DEFENSE: Is Jimmy Howard for real? 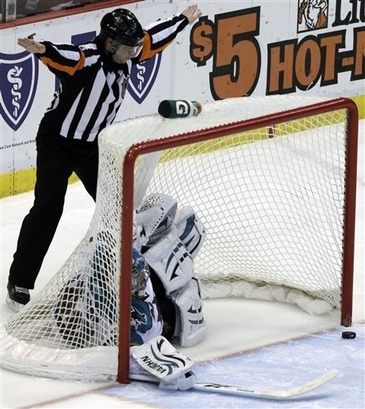 Is there a Cam Ward/Steve Mason/Carey Price stretch in his future? Does he belong in their company? Whither Ozzie? Does he belong in the Hall of Fame? And who’s No. 3? ONE QUESTION ABOUT COACHING: We know that Mike Babcock can coach a winner. But does he have the patience to coach a rebuilder? The Wings have been treading soft ice all season, hanging on as a playoff competitor by a thread, waiting for injured players to return, trying to recreate themselves as a team. To be honest, I think their effort this season has been remarkable. Babcock has squeezed just about every point out of this team that a coach can find. Without Howard, this team isn’t the Oilers, maybe the Blues. There is enough talent to be in the playoffs this year. But if I were Ken Holland, I wouldn’t count on the same bunch — not by a long shot — to make the playoffs in 2010-11. The decade-plus of excellence has passed. It’s time for a change. Let’s hope it’s not too painful.